In January of 2014, I made the decision to take control of my health. I had lost over 85 pounds before joining Catalyst, strictly from dieting. I kept putting off exercise because as someone who was never really athletic, I was intimidated. I slowly began taking classes but was really wanting something more focused on my needs. Luckily I stumbled across Catalyst SPORT. From my first consultation, I knew this was the place for me. Jason and the team really listened to my needs and made me feel comfortable. I went from being nervous about exercising to looking forward to my sessions. Not only have I continued to lose weight (I am currently down almost 100 pounds) but I'm seeing the biggest changes on my body yet... muscles where there were none before and just overall feeling healthier. 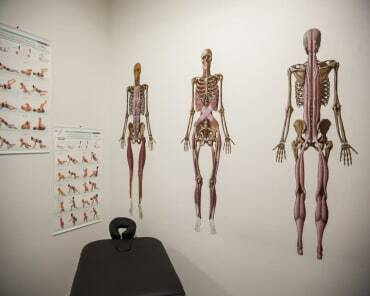 I met Dr. Kathy Dooley 2 years ago when I was suffering from a bad shoulder injury. I immediately became her patient when I realized that she was just as invested in me as I was, in finding out the “why” of my injury. Once I visited Catalyst SPORT and saw all that it is, I knew I had found a special place. At the time, I never knew just how much being a part of the Catalyst family would enhance my life. Using everything that Kathy taught me via movement‬‬ and breathing drills, my injury eventually healed. 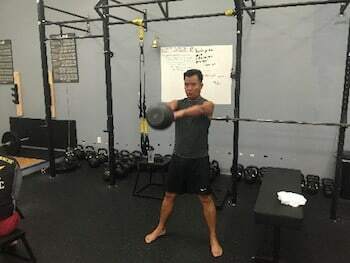 From not being able to lift my arm to shoulder height without pain, I went on to earn my SFG kettlebell certification, take a multitude of ‎strength ‬‬workshops, and attend the StrongFirst barbell certification, all in just over a year, with ZERO pain. With Jason's coaching & guidance, I also fulfilled a long time dream of competing in a powerlifting meet, coming home with two PRs. 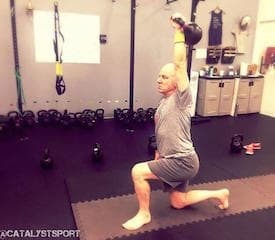 I've been lifting for over 30 years, and I'm ‎stronger‬‬ and more fit at 52 than I've ever been. After collegiate athletics destroyed my body and left me injured and unable to train or stay healthy effectively, I’ve been on a mission to get healthy. I knew that I needed specific help and guidance to get to some of the root movement and strength issues so I could actually get strong. I struggled to find practitioners that could help me problem-solve and understand me as an athlete. After talking to one of my wonderful teachers, Dinneen Viggiano, she recommended Dr. Kathy Dooley. Dr. Dooley is amazing! She looked at me as a whole, helped address and correct lingering injuries, and she encouraged me to do what I love, unlike a few practitioners I had seen along the way that told me I’d never run again, and discouraged me from running and lifting. Dr. Dooley introduced me to Jason, Joe and the trainers at Catalyst. They shared similar values and complimented my care by helping me build strength in a way that wouldn’t involve more over-training and injury. Through SPT sessions, my trainers helped me develop a program to address my weaknesses. So far, they have given me more than just an exercise program to make me work hard. As an athlete, I have always been able to do exercises and follow a program and work hard to a fault, pushing myself and compensating to reach my goals. Catalyst gets that and offers much more. They provide the knowledge, look at the big picture, and give specific, helpful cues that allow me to work hard in a safe productive way. I have always been very active but I was hoping to bring my fitness to the next level. My boyfriend told me about Catalyst and after hearing more about it, I was sure it would be an ideal fit. 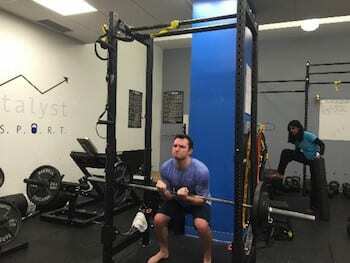 I love the fact that Catalyst establishes a strong team dynamic in a group setting, while still providing a personalized workout customized to my own goals. I always really enjoy any of the conditioning workouts when you are working with a partner. I have found this incredibly motivating as the other person is depending on you to finish the exercise so that they can begin their own movement. I find conditioning to be a fun and engaging (although extremely challenging!) end to the workout. I was a formerly-fit person seeking to get back in shape but looking to try something new. I had been doing the same lifting routine since high-school and wanted to try something more athletic and with greater variety. Plus, my priorities have shifted somewhat since I turned 30 from "I want to look good without a shirt on" to "I also never want to have back pain." 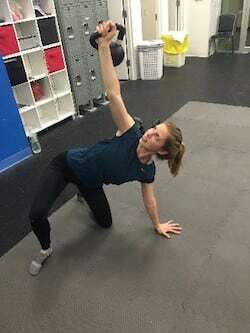 Kettlebells seemed like a possibility and Catalyst came up in a database of StrongFirst certified trainers....They are a great collection of lifting/movement geeks as well as lovely people. It is important to me to train with someone who practices what they teach and who is in better shape than I am. That builds my confidence in the whole thing and gives me inspiration to keep going, when I really want to stay home. Joe Boffi is that trainer. He is the result you want and he will help you get there. At least I believe I will eventually get there. I'm on my way. This may take a while. I'm a personal trainer and any time my clients complain to me about pain, I send them to Kathy. They feel better right away and that's without having to revisit Catalyst multiple times. Highly recommend. Great environment to get well or just strong (actually getting strong makes you well not just swell). I've been training with Jason Kapnick for three years, and have gotten in the best shape of my life as a result. Jason is one the most knowledgeable, passionate, and effective practitioners in the fitness industry. 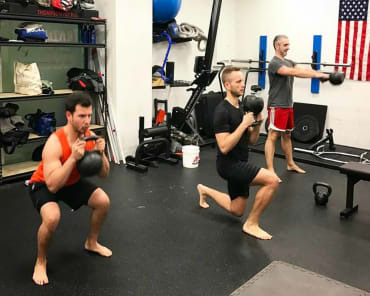 The proverbial triumvirate of Jason, Joe, and Kathy is sure to disrupt the New York fitness scene in a majorly positive way. Watch out, world. This group is sure to do big things. I've definitely seen many positive results being here, ranging from major improvements on my maximum number of chin-ups/pull-ups, benching full plates, and making huge strides on my deadlift. I've been continuously setting PRs on my deadlift at Catalyst and getting closer to the 300 lb mark! A lot of my favorite memories have been at the end of our workouts when we do conditioning, as it's a time where everyone gets together and does the same routine. I remember one instance when fellow SPT member Hursh was responding to a conditioning routine that involved the exercise bike saying, "it's only the bike! Won't be so bad!" Little did we know we were doing multiple rounds of 30 seconds each, and it ended up being way more intense than expected! It's not your everyday exercise bike! I was training with Jason at a commercial gym; when he opened Catalyst, he invited me to check it out – I did and never looked back. One of the best things was switching from personal training to semi-private training about a year ago. I now come more often and, most importantly, I take responsibility for my own workout – while still getting the coaching and encouragement from the Catalyst coaches. Recently, one of my frequent semi-private partners referred to me as the “get-up guy,” in honor of my enthusiasm for and proficiency at Turkish Get-Up, which is my favorite of the core exercises. I don’t know what I’d do without it. 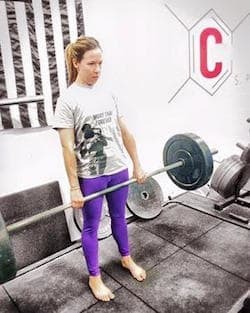 Many of us have other, related interests, whether it’s power-lifting competitions, mixed martial arts, dance, professional interests in related fields, etc. Mine is singing – the abdominal work and breathing in my Catalyst workouts are a perfect complement to my voice work and (amateur) choral and cantorial singing. Training with Catalyst has prevented, if not eliminated, my running aches and pains. I used to suffer from IT Band Syndrome and it stopped after I started training with Jason and at Catalyst. It's all about the core and glutes!! I started training with Joe Boffi in 2013. When he left my local gym to start Catalyst the following year, I knew I couldn’t let a good thing go. 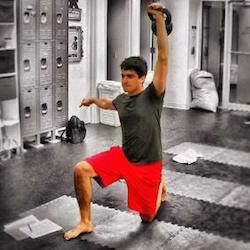 Initially, I continued doing 1-on-1 personal training with Joe. But when Catalyst introduced semi-private training (SPT), it was a perfect fit. 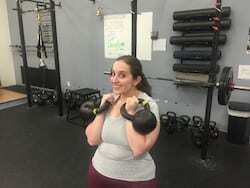 Now, I have the benefits of a full team of trainers and classmates who encourage and push me to do my personal best, and the class schedule is flexible enough that no matter how busy I am I can fit a workout in. I play a lot of sports - softball, in particular – and so my training goals are to build explosive power and strength. Over past few years, my batting average and slugging percentage have increased significantly, I am more agile on the field, and I am faster around the bases.